The explosion of RNA-Seq data has enabled the identification of expressed genes without relying on gene models with biases toward open reading frames, allowing the identification of many more long noncoding RNAs (lncRNAs) in eukaryotes. Various tissue enrichment strategies and deep sequencing have also enabled the identification of an extensive list of genes expressed in maize gametophytes, tissues that are intractable to both traditional genetic and gene expression analyses. However, the function of very few genes from the lncRNA and gametophyte sets (or from their intersection) has been tested. Methods for isolating and identifying lncRNAs from gametophyte samples of maize are described here. 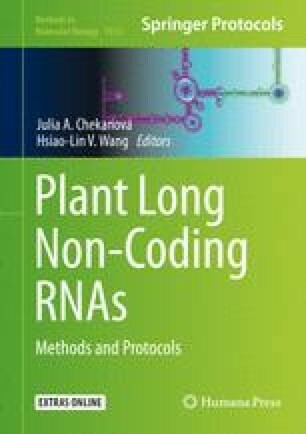 This method is transferable to any maize gametophyte mutant enabling the development of gene networks involving both protein-coding genes and lncRNAs. Additionally, these methods can be adapted to apply to other grass model systems to test for evolutionary conservation of lncRNA expression patterns. We thank Z. Vejlupkova and R. Cole for their contributions to the development of the RNA isolation and library preparation methodology. This work was supported by National Science Foundation Plant Genome Research Program Awards, DBI-0701731 and DBI-1340050, to Matthew Evans and by Huazhong Agricultural University Scientific & Technological Self-innovation Foundation to Lin Li and Linqian Han (Program No. 2662016PY096).